Exciting times… I have just received the first copy of the latest science book – What Makes Your Body Work? – from A&C Black, and it looks fabulous! One of the really great things about doing non-fiction is seeing how the technical side of producing this sort of book works. I am in awe of illustrators in general, and I’ve struck particularly lucky with Mark Mones, who has illustrated all my A&C Black books so far, and made them look superb. Thanks Mark! The book will be out on April 9th. Meanwhile, I’m off to Kinross on Thursday 26th and to the A K Bell Library in Perth on Saturday 28th to do events, and the week after that it’s the Scottish Children’s Book Awards prize ceremony on March 4th, which should be a great day for all of us authors – and hopefully for readers too! 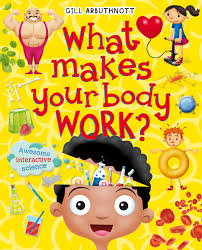 Posted in children's science, uncategorised, writing | Tags: A&C Black, mark mones, perth a k bell library, Scottish childrens book awards, what makes your body work?